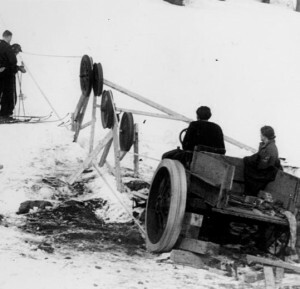 The first rope tow in the U.S. was built in Woodstock, Vermont, and began operation on January 18th, 1934. Congratulations to Cynthia Kelley from Essex Junction who was the first correct responder. Greg Dirmaier also added the fact that it was located on Gilbert’s Hill. Dairy farmer Clint Gilbert leased his hillside pasture for $10 to a group that built the tow using a Model T for power. In fairness to our Canadian friends the Woodstock design was based on a rope tow built in 1932 in the Laurentians. 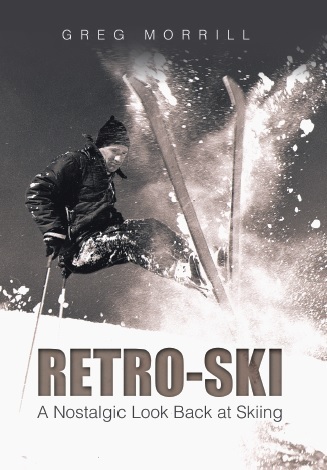 The rope tow was a barrier for beginners that significantly reduced the popularity of skiing! Ask anyone who mastered the rope tow and they would tell you that it was a lift for experts, but where did you find most rope tows: on the beginner slopes. One thing’s for sure it did make coming down the hill seem easier if you made it up! So let me show you how to use a rope tow. I’ll stop here, but we didn’t even get to how to get off the rope tow! Let’s look at some other aspects of the rope tow. The rope: Ropes were rough surfaced when new with diameters greater than one inch. They would wear through conventional ski gloves or mittens so special tow mitts had to be used. Many probably expensive Christmas-gift ski gloves did not survive their first day on a rope tow! Also if the moving rope came in touch with any other surface it would quickly burn the fabric or skin(!). You could tell rope tow users by the brown burn marks on their parkas. With enough use, the ropes would become smooth and difficult to grip particularly for small kids. It was not unusual to find a clump of kids midway up the rope with the rope just slipping through their mitts waiting for the first adult to “pick them up”. If the rope was hard to grip with your own weight, try it when your weight more than doubled thanks to a clump of kids! Oh, and rope is heavy! If you were the only one on the rope tow, then you had to lift the entire length of rope yourself. 600 feet of rope can be verrrry heavy. The track: Every night the track where your skis slide would be groomed flat so the first riders had a smooth surface. Gradually as skiers rode up they formed two ruts, one for each ski, and as the day progressed these ruts would get deeper particularly in Spring conditions. Doom awaited those who tried to get out of the ruts! Now there were some brave souls that were able to escape the two ruts and start some new ruts which meant now there were spots where you had to choose among 3 or 4 ruts. An indecisive moment could lead to disaster – you in a pile of equipment with the rope chafing away your parka! In soft snow conditions moguls would form in the track adding even more degree of difficulty. 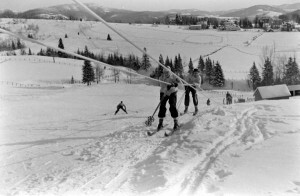 A related aside concerning that first rope tow, Bob Bourdon, a very well-known name here in Stowe, was the first successful rider up the Woodstock rope tow. However at least one other person had attempted to ride the tow before Bob, but had fallen due to the roughness of the track! Loose Clothing: You may have seen warning signs around lifts about loose clothing. If you aren’t sure what loose clothing means, just ride a rope tow! Rope tows have a way of ensnaring anything remotely loose and wreaking havoc. There were always horror stories about people strangled by scarves and the like, but hardly a day went by that somebody wasn’t separated from a hat (particularly those long stocking caps) or a glove which went flying around the bull wheel at the top. Speed: Many rope tows used old automobile engines and transmissions for power. For general use they seldom got out of low gear. But if the operator was so inclined he could speed up the rope even getting into higher gears. For the expert this was a great feature where you could literally go up the hill faster than you came down! So on non-busy days if you knew the operator you could usually goad them into speeding up the rope. If you knew the operator too well, they could give you a truly memorable ride up the hill. I watched a friend of mine shoot straight up the hill, past the lift shack, and into the woods after receiving a special high speed ride! For those beginners that survived the rope tow and were ready for the next level, the next challenge awaited, usually a surface lift such as a T-bar, J-bar, or Poma lift. Check out this week’s trivia questions, that’s right, there are two this week. Still no tangible prizes, but if this catches on I’ll solicit some. Your article on rope tows brought back memories to me. When I was in high school, I worked at Locke’s Ski Hill in Amesbury, MA where they had three rope tows. Your recollections made me laugh recalling all the mishaps of riding the ROPE. You had to be strong enough to pull your own body weight up the hill with the rope always twisting in your hands. If someone ahead of you started to slip, the pile up could be massive until the lift operator stopped the rope. Then that caused the problem of the rope running backwards with the skiiers still holding on. The riders were like dominos. I remember riders who would grab hold of the rope and not let go no matter what kind of twisted pile they were in while being dragged up the hill.